The 8.2 is one popular Detroit Diesel engine that was made. It was famous for use in single axle dump trucks and Chevrolet B series buses. Since it was made for more than one application, it had a big displacement. Some people refer to this block as the fuel pincher V8. 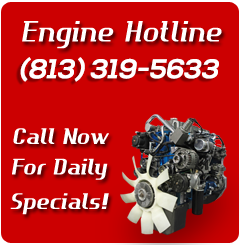 GotDieselEngines.com has a reliable 8.2 l Detroit Diesel for sale here. The specs of the 8.2 are kind of hard to find on the Internet. The horsepower has a variable range. Some say that it is 165 hp and others say it is 175 hp. What matters is that the heads are in good shape. It is not easy to find through a web auction a good running 8.2 liter fuel pincher engine. If you have read some web forums, the weak head gasket will be there. The OEM gasket is not what is weak. People run old blocks without trying to fix them up. You have to change the fluid regularly. Using quality oil helps out a lot. There could be valve leaks and gaps down in the block that go undetected. This is when problems happen. GDE sells preowned and not rebuilt 8.2 Detroit engines. These are taken out of the only stock that we have which is salvage. The heavy-duty trucks that had the four-stroke installed were still in good condition at the time of dismantling. What is left is the best of the best parts of which we taken into our warehouse. We can over almost all of the original parts on the 8.2 block. There are some things that no one covers. This short list of components is easy to find in our documentation. Getting anything out of a scrap yard has a degree of caution to it. We choose only to handle our business professionally. If we cannot verify were a block came from, we refuse to add it to our inventory. People shop here all the time for old builds no longer made. Names like Cummins, International Harvester and CAT are what we provide. We do supply a pretty good number of General Motors units. All of these carry our standard auto parts warranty. Get your hands on the infamous fuel pincher V8. They are getting harder to find every year. From hauling equipment to just plain old gravel, the torque and horsepower are two pluses for the GM built assemblies. Your price quote is arranged automatically when you use our computer. It knows the current sale price and applies any other discounts. Call our toll-free number to speak with our team. We can discuss mileage or other concerns you might have before you order. If you are just running a price check, that is OK with us. We want to help you find what you want even if you do not buy it here. I am a diesel engine expert.